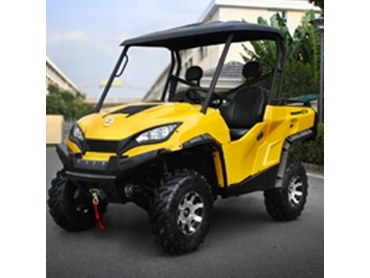 The Crossfire 1100GT EPS is the most powerful UTV at the time of print although the Can Am Rotex powered 1000cc will take this title shortly. The 1100cc DOHC EFI Cherry engine at the heart of this machine puts out an unprecedented 70Hp. Although the best trait is its smoothness. Unlike the big bore single cylinder or twins of the past that rattle every bone in your body. The 4 cylinder DOHC car engine provides you with a sublime smooth rider no matter how many hours of work are ahead. The smoothness is in part to the engine but CV Tech Invance transmission has a lot to do with 2014 models ride quality. The transmission is made in Canada and utilises the very latest CVT technology on the planet to make sure your always in the right gear and in optimum power range. The transmission also has a dual range transfer case with high and Low gearing. Next in why the Crossfire 1100GT has the best ride in the class is the ByDual-Arm design. So the machine is floating at every corner. No wheels are connected and can travel independently up and down without influencing the othersider. No connection means less carry through the chassis means a smoother ride. To continue our philosophy of supporting a hard days work is the 2013 models EPS or electric power steering. Yes just like your car this work horse has power steering .